The most detailed accounts of Jesus' birth are contained in the Gospel of Matthew (probably written between 65 and 90 AD/CE) and the Gospel of Luke (probably written between 65 and 100 AD/CE). There is considerable debate about the details of Jesus' birth among even Christian scholars, and few scholars claim to know precisely either the year or the date of his birth or of his death. The nativity accounts in Matthew and Luke do not mention a date or time of year for the birth of Jesus. In Western Christianity, it has been traditionally celebrated in the liturgical season of Christmastide as Christmas on 25 December, a date that can be traced as early as 330 among Roman Christians. 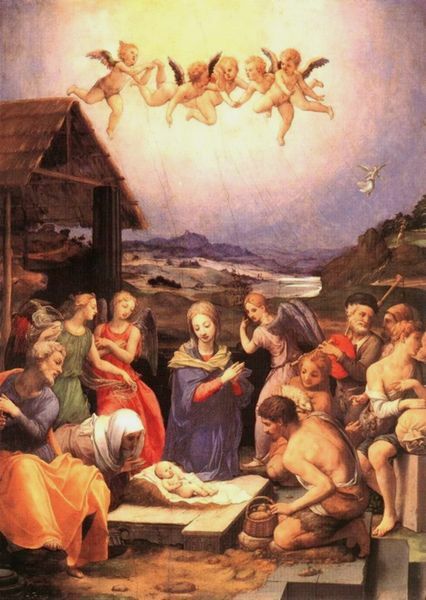 Before then, and still today in Eastern Christianity, Jesus' birth was generally celebrated on January 6 as part of the feast of Theophany, also known as Epiphany, which commemorated not only Jesus' birth but also his baptism by John in the Jordan River and possibly additional events in Jesus' life. Many scholars note that the event described in Luke of the shepherds' activities suggest a spring or summer date for Jesus' birth. Scholars speculate that the date of the celebration was moved in an attempt to replace the Roman festival of Saturnalia (or more specifically, the birthday of the pagan god Sol Invictus). In the 248th year during the Diocletian Era (based on Diocletian's ascension to the Roman throne), Dionysius Exiguus attempted to pinpoint the number of years since Jesus' birth, arriving at a figure of 753 years after the founding of Rome. Dionysius then set Jesus' birth as being December 25 1 ACN (for "Ante Christum Natum", or "before the birth of Christ"), and assigned AD 1 to the following year � thereby establishing the system of numbering years from the birth of Jesus: Anno Domini (which translates as "in the year of our Lord"). This system made the then current year 532, and almost two centuries later it won acceptance and became the established calendar in Western civilization due to its further championing by the Venerable Bede. However, based on a lunar eclipse that Josephus reports shortly before the death of Herod the Great (who plays a major role in Matthew's account), as well as a more accurate understanding of the succession of Roman Emperors, Jesus' birth would have been some time during or before the year 4 BC/BCE. Having fewer sources and being further removed in time from the authors of the New Testament, establishing a reliable birth date now is particularly difficult. Alternatively, based on the idea that a Jupiter-Saturn conjunction was the "star" the Wise Men followed, the birth could be as early as 8BC/BCE. The exact date of Jesus' death is also unclear. Many scholars hold that the Gospel of John depicts the crucifixion just before the Passover festival on Friday 14 Nisan, called the Quartodeciman, whereas the synoptic gospels (except for Mark 14:2) describe the Last Supper, immediately before Jesus' arrest, as the Passover meal on Friday 15 Nisan; however, a number of scholars hold that the synoptic account is harmonious with the account in John. Further, the Jews followed a lunisolar calendar with phases of the moon as dates, complicating calculations of any exact date in a solar calendar. According to John P. Meier's A Marginal Jew, allowing for the time of the procuratorship of Pontius Pilate and the dates of the Passover in those years, his death can be placed most probably on April 7, 30 AD/CE or April 3, 33 AD/CE.